Okay, this time it isn’t Ancestry’s commercials that annoyed me in Friday night’s episode of Who Do You Think You Are? but rather the science used by Ancestry in the show itself. Fine. But what was showing on the screen? I grabbed a screen capture (left) just to be sure I wasn’t seeing things. Yep, there it is, bold as brass: Eric Sonjowoh. 10th cousin. Now some of the DNA results shown were from Ancestry’s new autosomal DNA testing1 — an as-yet-unlaunched product2 designed to compete with Family Tree DNA’s Family Finder test and 23andMe’s Relative Finder. But Ancestry isn’t testing any more autosomal DNA than the other companies — the Ancestry scientist mentioned about 700,000 sampled areas, the same as the others — and autosomal DNA testing simply can’t get you back to 1600 or 1700 with anywhere near the kind of accuracy to be able to say someone was a 10th cousin (and not an 8th or 9th or an 11th or 12th or even a 5th or 6th cousin). The hitch is that autosomal DNA goes through a process called recombination3 — a random shuffling that takes place as that kind of DNA gets passed down through the generations. Once you get past third or fourth cousin, autosomal DNA may be able to say you’re related, but it’s a total crap shoot as to what degree of cousin you might be. Translation: it’s a guess. A scientific guess, for sure. One based on careful study and analysis, for sure. But it’s still a guess. Translation: when you say the mutation rates are known for many of these loci in several populations, you’re also saying they’re not known in others. At best, only some of what we need to know to make good predictions is known, and some isn’t. And there’s a lot of variation. See? It’s a guess. It’s akin to the old GIGO issue — garbage in, garbage out. In this case, not enough data in, not enough confidence in the data out. If for any single line of YDNA we encounter no mutations at all, two people could look genetically very much alike and yet the MRCA could be very very far back indeed. And if for any other line we encounter more mutations than the average, two people could look less genetically alike than they really are and the calculation of how far back the MRCA is would be skewed in the other direction. Bottom line: doesn’t matter whether it was an autosomal DNA test or a YDNA test or both. The results can’t show that Blair and Eric were 10th cousins. Now don’t get me wrong. I loved Friday night’s episode. Great use of original records, wonderful effort not to take the records at face value but to evaluate them in the context of the time and place, and a good dose of cold hard reality in dealing with slavery and slave ancestors. Loved the show. But c’mon Ancestry… Cousins, sure. 10th cousins? C’mon. Words matter. Even if they’re just on graphics. Thank you, Judy, for putting into context references about DNA testing that I thought was questionable in the show, WDYTYA. I do love the show too for the different areas of research each follows and the interpretation of records and oftentimes find myself questioning the results concluded. This show with its slavery ancestry was very interesting and as you say “a cold hard reality”! I am very interested in DNA testing and while am very new at drawing any conclusions from the results of my father’s or my results, I am making new connections that quite possibly are from a MRCA. Thank you for such an interesting and informative posting. Linda, I’m a self-confessed DNA junkie — have done every kind of testing I can. And though it’s enormously useful in so many ways, it also leaves a lot of unanswered questions, particularly for autosomal testing… and nobody should promise more than the test results can really deliver. That’s the gut reaction I got to that graphic: it promises more than testing alone can deliver. You confirmed my suspicion; obviously I need to get up to speed on this DNA thing, but it sure seemed more than a bit “off the cuff”. Thank you for the explanation. Also irksome in that film was the piece about the conjuror. At one point they flashed a shot of a newspaper article that looked to me like the local black folks were upset about the guy or his actions. I’ve known several conjurors (they are still around; you run into folks like that in public health work even if you’re not looking for them) and plenty of the people around them, but never have I known a community to get up in arms about them, nor have I ever heard of such. Upset about someone who does “black magic” or Voodoo maybe but conjurors are thought of as both helpful and positive in my experience. I checked with some folks after the film and could find no one who knew of a circumstance where a conjuror would/could have gotten a community upset enough to create a newsbit. And a conjuror resolving an incident with a gun? Come on. The guy was possibly a conjuror who either took up another “discipline” or crossed a line into mental illness, but so far as any of us know they are considered healers who sometimes incorporate a bit of ‘prediction’ into their work. So the man seems to have been somewhat misrepresented in my book, not a helpful thing for the rest of us as genealogists. Seems to me we need to be careful about representing all facts responsibly. SJ, it seemed to me — and I could be wrong — that it was the local white community that was upset at Sauney Early, and the local black community that was upset when the white man who shot him was freed without facing criminal charges. I can certainly imagine a black-white split over this in the years immediately after the Civil War, can’t you? I agree, Judy. I think it was the local black community who was up in arms when the shooter was released, not at Sauney. Although, because it was presented so quickly and without much explanation, it was a bit confusing. Thanks for that info, Jenny. It was a bit confusing. Fortunately, if we want (or need) to check any facts (like exactly what words were spoken and what was displayed on the screen), the episode is available at Hulu.com and can be stopped and started as much as needed! Yes, I agree that there was some confusion on the conjurer issue and, possibly, misrepresentation. What I saw was that the first article said that Sauney had no followers, but the second one said that he had influence among his community. (They didn’t read these parts out loud.) So, either the writer’s interpretation was different than reality in, at least, one of the articles or Sauney’s status and reputation in the community changed between the two articles. However, they do a lot more background research that we never see on the show, so perhaps they had more evidence to support eh belief that he was indeed a conjurer. Or the writers of the two articles had different biases. Can’t forget that possibility either. 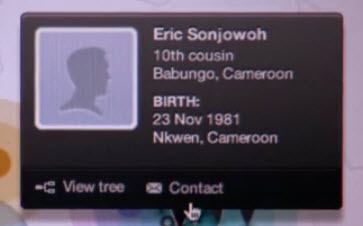 Don’t know how Ancestry secured Eric Sonjowoh’s DNA but possibly when The Genographic Project, undertaken by the National Geographic Society, IBM, and the Waitt Family Foundation was done in 2005. This was headed by Spencer Wells – more about him on Wiki. I agree Ancestry should not have defined him as a 10th cousin……..
Sure will be interesting to see what happens when this product actually opens to the general public. TV shows usually raise more questions than answers, of course (kind of like ‘truth’ in newspapers?! Great take on the latest scientific “leaps” from Ancestry, Judy. The science of the test itself is good, Celia. I’m a real fan of atDNA (autosomal DNA) testing. I just don’t want even the words on a graphic to promise more than the test can actually deliver. Cousin, absolutely. 10th cousin? Uh… no. I think most are going to think the results were based on atDNA, when of course, they were based on connecting Blairs or his fathers yDNA to the match. I am sure they worked on the cousins lineage as well, and probably why it shows ’10th cousin’ – they blew past the paper trail, and focused on how DNA can help you find a ‘spot’ to search, but than of course, the work begins again. And I am looking for the release where it said they had access to 2 projects. I think we’re all waiting to see what information they had access to! No real info in the FAQs yet, for sure. I’m glad you discussed this; I called BS on this when I first saw it (several months after it first aired). I’m a n00b to both DNA testing and genealogy, but none of the major autosomal tests will even venture a guess past 5th cousin, referring to the rest as “distant”. And even at that, their relationship guesses are just that, due to the randomness of recombination. I wonder if Mr. Sonjowoh was tested at all. Maybe the producers, once they found their area of interest, tried to find someone who was photogenic and spoke English. This would have been cheaper and more time efficient than testing the thousands of Cameroonians necessary (I estimate) to find one match. I wouldn’t be surprised to find out they did this. I have no doubt that both cousins were tested. I just understand that it isn’t realistic to declare them as 10th cousins, as opposed to sixth or seventh or 11th or 12th cousins.